Whoops, meant to put up a post on Wednesday. Well, these things happen. Sorry, gang. Let me remind you that I’m doing question time again, so toss your questions into that comments section (not the comments for this post, but that previous one I linked) and I’ll give you answers. Some of them possibly truthful! I’ll probably start taking a crack at them this coming Monday, so for God’s sake, clear your calendars. …or at least something that vaguely looked like Swamp Thing while still being called “Swamp Thing,” and I’ve bought worse things for worse reasons so, you know, don’t think you can shame me on this. Also, making thing worse, pictured there is the variant cover for the issue, with Swampy and Wondy posin’ pretty for the camera, and silly me, I thought that was the 1 in 25 variant. Nope, that’s the 1/100 variant, so only those elite retailers who bought 100 copies of the regular cover got a copy of this darned thing. Well, don’t look at me, since I just started a brand new shop, I ain’t ordering a hundred copies of anything yet. And because it’s brand new, it’s currently going for stupid prices on the eBay, so I’ll have to wait a few weeks where, like most of its variant cover brethren and sisteren, the hotness eventually cools off and prices will be lowered to the “please for the love of all that’s holy take these off our hands” levels. Of course, with my luck, this will be the exception and will hold its collectible value, at which point I’ll have no choice but to sell my blood and the blood of a few “volunteers” in order to afford it. Look, I own Swamp Thing slippers. I’ll stop at nothing to maintain the Swamp Thing collection. I could have sworn I read somewhere that DC was going to stop making these variants so hard to get. I guess not. 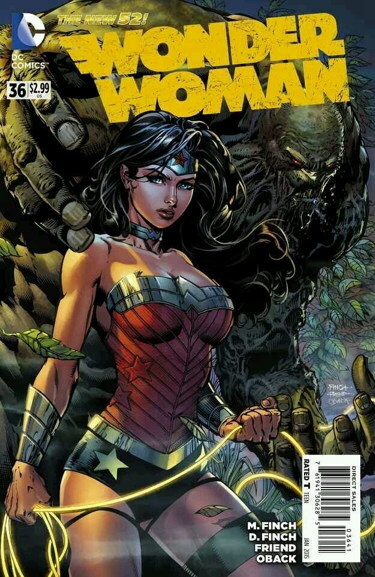 Wait, shouldn’t Wonder Woman be combing her hair in front of a mirror while Swamp Thing creeps in the window on that cover…? I hadn’t seen that Finch drawing of Swampy, but yes, it’s strange. In the comic proper he does seem to be drooling or leaking in the mouth area, but I thought that was just because Wonder Woman was kicking and punching him in the face so much, but I guess he’s just always drooling…? Please don’t buy this book, Mike. You will start crying if you even buy it at the regular price. Meredith writes the words “vegetative injustice” in a sentence. Print out the cover, hang it on your bedroom wall, and you will still weep. I bought the non-variant issue because I wanted to see the train wreck, too. The guy in line in front of me said how he hated the dialogue but loves David Finch’s artwork, so he will keep buying the book. I wanted to dry-swallow two Xanax while I waited for the guy to stop talking. Some variants are easy to get, Swamp Mark — the Selfie Month, or Darwyn Cooke Month, etc. ones — but other, more targeted variants, like this one for Wonder Woman, are still rationed to goose orders. thanx for the info, Rob S. too bad they’re always the one I want. cool … I want one!! is that Swampy or the HEAP?